Shockwave Therapy creates Radial Pressure Waves and was first introduced as a medical treatment 20 years ago to eliminate kidney stones. It was discovered that one side effect from treatment was accelerated tissue healing in the area. 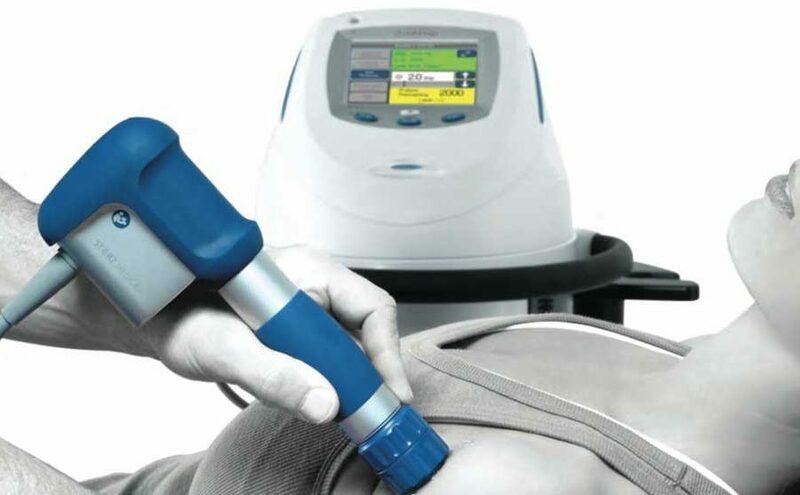 The acoustic energy created by Shockwave Therapy is a non-invasive treatment method for long-term tendon injuries with very few side effects. The pressure waves penetrate the tissue and reduce pain by inhibiting the transmission of pain signals (Gate Control Theory). It also increases cell metabolism and promotes the release of pain and inflammatory inhibiting substances. Revascularization of the area occurs with new blood flow promoting tissue healing and regeneration. Shockwave works well for any insertional tendinopathy where soft tissue attaches to the bone. It also works well on trigger points and muscle tension. How long is the treatment and how often do I need to be seen? After the initial assessment, each follow-up visit is 15 min. It is recommended you come in for 3-5 treatments separated by 5-7 days each. I can be uncomfortable at times as it is applied directly to the injured area. However, it is usually well tolerated. The injured area will normally feel better after a treatment and then may become sore 24-48 hours post treatment. The soreness should dissipate over the following 24-48 hours and before your next treatment.